St. Augustine has traditionally been one of the best lawn options for southern landscapes. It has a lot of great benefits: The deep green foliage color is attractive, its large leaf blades shade out weeds and it can tolerate a bit of shade. Mis-treat your St. Augustine, however, and it will abandon you. One of the most common problems with St. Augustine lawns is over-watering. Most homeowners simply water it too often and too shallow. This bad watering habit coupled with our heavy soils that prone to compaction leave St. Augustine lawns suceptible to all sorts of problems. It makes the lawn much more suceptible to drought stress and cold damage due to a shallow root system; the excess moisture builds up in compacted soils suffocating roots; the lawn becomes much more suceptible to disease like brown patch and take-all root rot. Another bad maintenance practice is mowing St. Augustine lawns too short: It’s best to allow them to maintain a height of 3″ for best health. Learn more about proper mowing practices here. Here is an example of a St. Augustine lawn abused in just such a manner for many years. You can see that the lawn thinned to the point where you can see the runners on the surface of the soil. 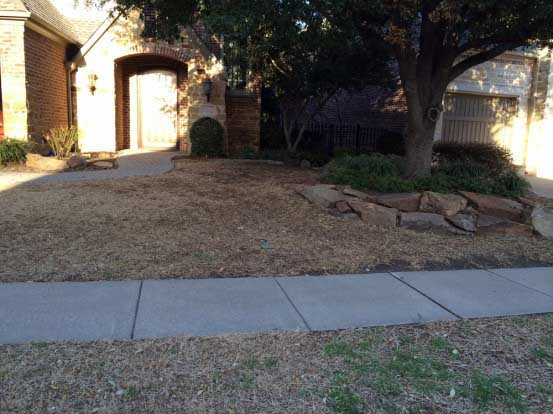 The minimal root system that was left in this lawn, due to soil compaction and improper watering, left this St. Augustine lawn subject to fatal cold damage this past winter. If you’ve had maintenance issues or problems with take-all root rot in your St. Augustine lawn, you might consider switching to a Zoysia lawn. 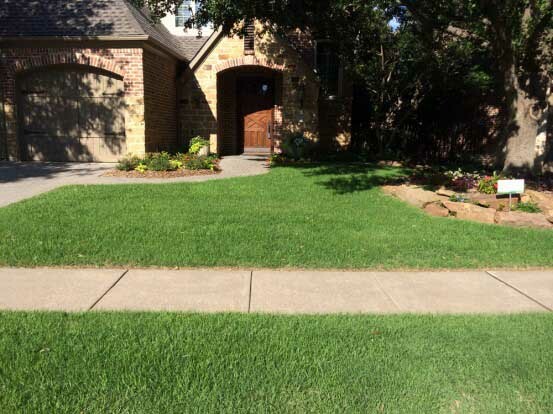 Now, Zoysia lawns will also require proper watering (infrequent and deep), regular organic feeding of the soil and seasonal lawn fertilizations as well as core aeration from time to time. All turfgrass requires the proper light conditions (6 hours of sun) and proper maintenance in order to thrive.